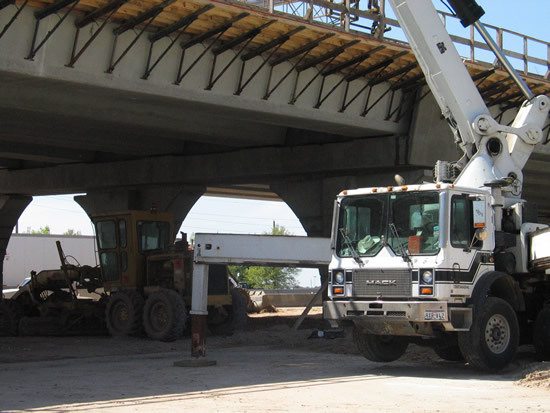 For more information including schematics and project schedules please visit the official TxDOT site at http://www.katyfreeway.org. (High resolution 530k) Looking west from near State Highway 6. To the left is old frontage road, now closed from this point to the west. To the right is the temporary connection between the old frontage road behind me to the new frontage road..
(High resolution 467k) A look at the Park Ten Overpass from Park Ten looking south. The construction through this area is progressing incredibally fast. By the time I can get these photos posted the horizontal sections between the columns will not only be formed, but the concrete poured and forms removed. 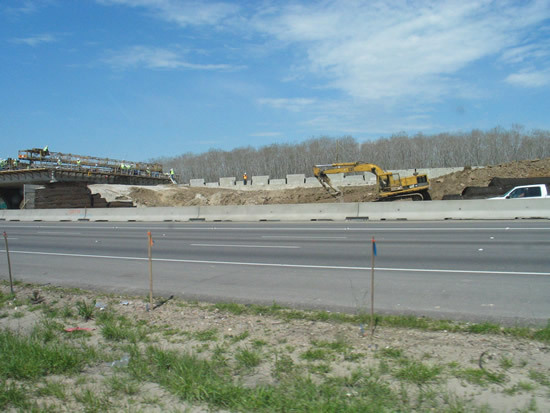 (High resolution 255k) Here they are removing the old west bound frontage road. This machine rips and chews up the old material (asphalt, concrete, etc.) and dumps it into a waiting truck. (High resolution 93k) Approaching the Barker-Cypress overpass from the east. 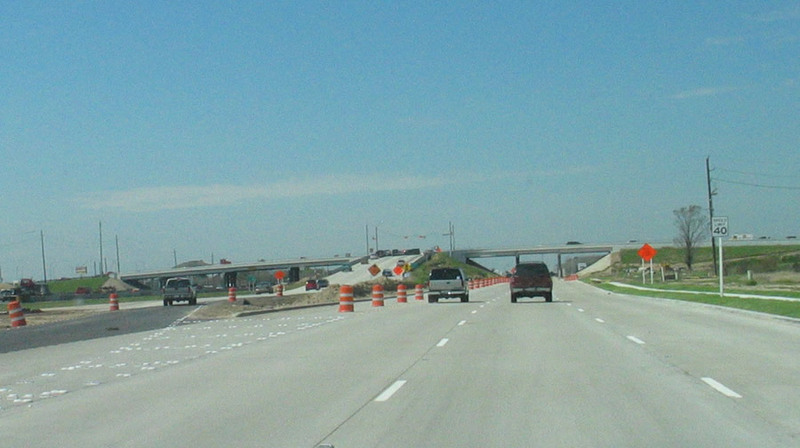 Note the temporary connection to the existing intersection. 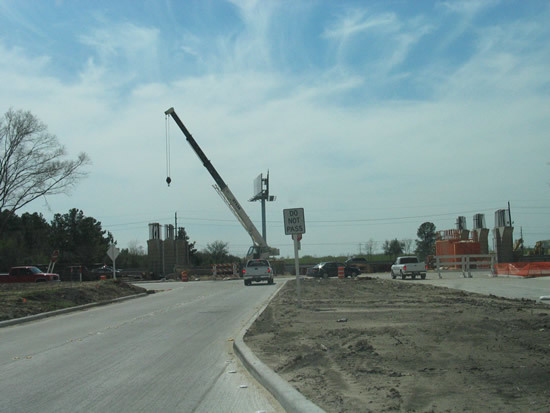 The future configuration has Barker-Cypress at grade level and I10 crossing over Barker-Cypress. I would not want to live around here when this intersection closes. (High resolution 446k) Drivers view on the frontage road getting closer to Barker-Cypress. Just off to the right is a small section of old Barker-Cypress. 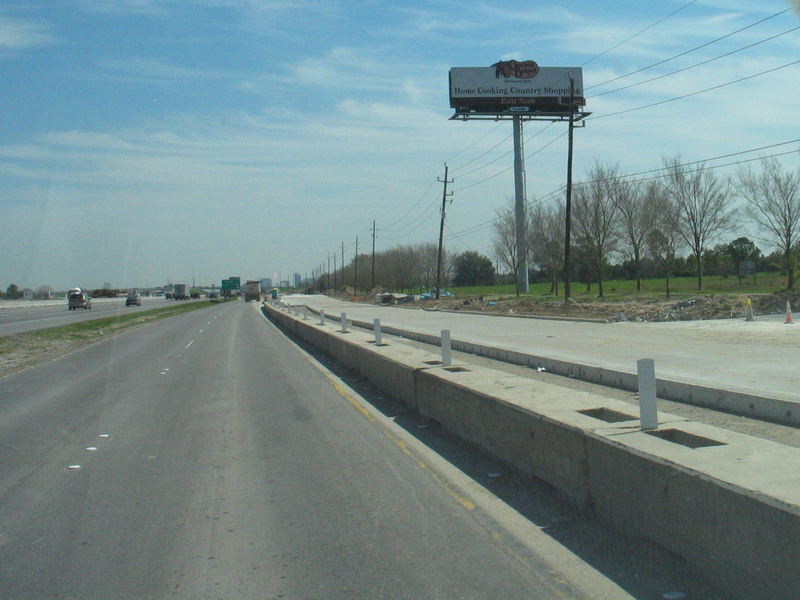 A section which dates back to when State Highway 73 went through this area. I will post pictures of "old Barker-Cypress" soon. (High resolution 443k) Approaching the Greenhouse Road overpass. The white/gray strip is the new main lanes. 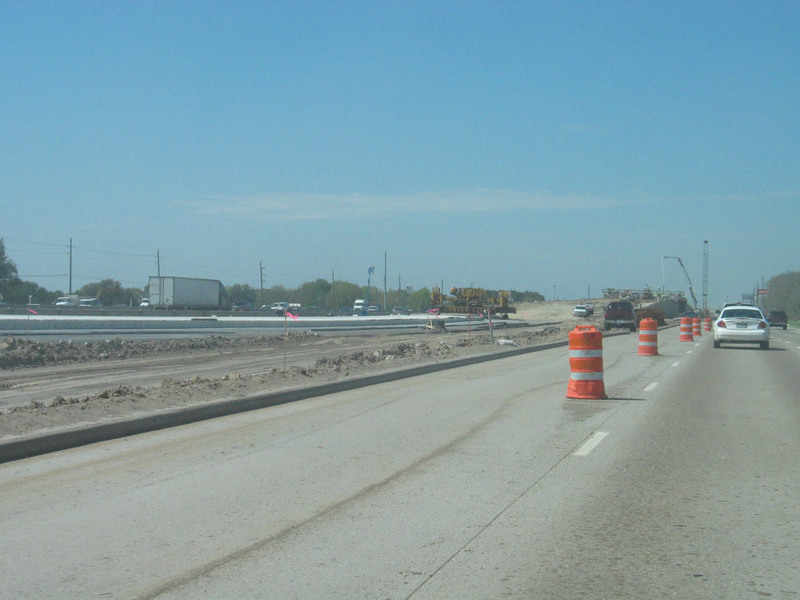 Two lanes are poured and curing in this photo. 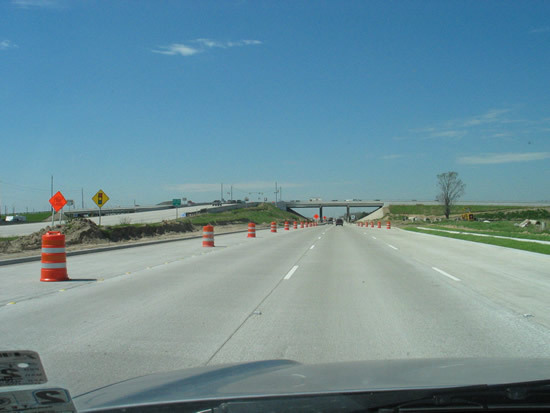 Again, the construction is at such a fast pace, that by the time these photos are posted the section of the overpass in the background is nearly complete and the other main lanes are ready for concrete. (High resolution 506k) A closer look at the Greenhouse overpass. (High resolution 537k) A look at the Greenhouse overpass from the east bound frontage road. The lanes in the foreground are the east bound main lanes. I can't believe I got a picture of the main lanes without a single car. (High resolution 475k) A drivers view from the old east bound frontage road. 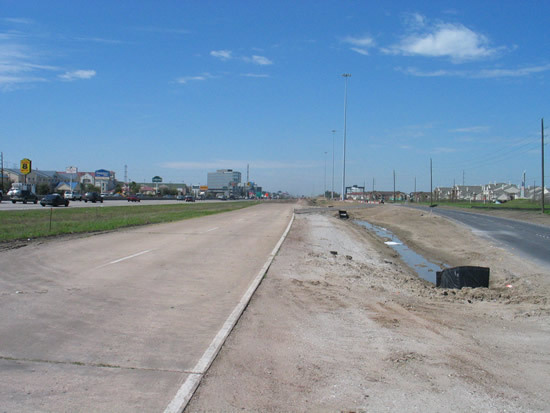 To the right is the new frontage road. 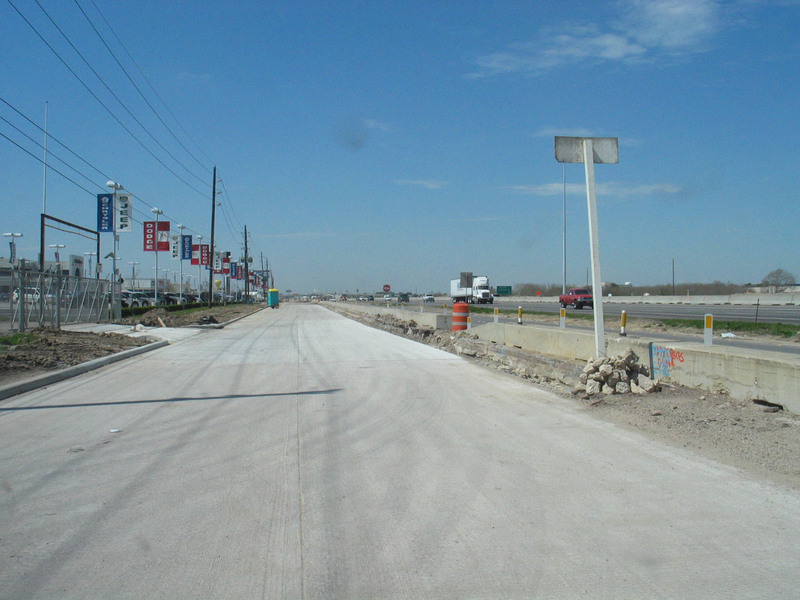 (High resolution 489k) Another look at the east bound frontage road looking west.